Another merger deal, followed by some more layoffs. No big surprise, right? Well, not if you happen to live in Canada. Not if the company that was acquired was Tim Hortons, whose coffee and doughnuts are an iconic national brand. It was even founded by a player of Canada’s unofficial national game, the late NHL defenceman Tim Horton, who was killed in a car crash in 1974. And particularly not if the company doing the acquiring — and now orchestrating the layoffs — is Burger King, the giant US division of 3G Capital, a Brazilian investment firm. It’s not the Brazilian part that irks Canadians: it’s having a national icon swallowed up and jobs spat out again by an American behemoth. “Another foreign takeover approved by the Conservatives and another round of pink slips for Canadian workers!” thundered David Christopherson, a member of Canada’s New Democratic Party, a left-wing opposition party, in parliament in the wake of the news that the newly merged Burger King/Tim Hortons would axe 350 jobs at the Tim Hortons head office and at regional headquarters. In fact, between listening to the political rhetoric and reading some of the comments online, I felt as if I had been transported in time back to the heyday of Canadian economic nationalism. “Now if we could only get Canadians to boycott “Burger Tims” for laying off all our citizens!”, tweeted @DyBee. She got at least one taker, who pledged “I will no longer go to Tim Hortons #canadianjobsmatter”. It’s a tempest in a teapot when you consider that cross-border mergers hit $1.1 trillion (Dh4 trillion) last year, up from $713 billion in 2013. But as the Tim Horton’s/Burger King merger negotiations showed, even what should have been a straightforward deal to form what became the world’s third largest fast-food chain drew ire on both sides of the border. The deal involved Burger King relocating its head office to Canada in one of the so-called tax inversions, a strategy to cut the new company’s corporate tax burden. Ohio Senator Sherrod Brown, a Democrat, announced he planned to boycott Burger King in future, to protest that company’s lack of patriotism. In Canada, the angst isn’t just about job losses or about patriotism, however. It’s about identity, which makes the whole debate even trickier. And it goes back a long, long way. And it just may matter. Here are the roots of it all. Consider, for a moment, that you live in Canada, and that a significant chunk of the jobs in key regions are directly or indirectly provided by a company on the other side of the US border — typically, an automaker, an auto parts manufacturer or, in western Canada, in the energy industry. Then, if you’re a blue-collar worker and you get home at the end of your working day, when you turn on the television, nearly all of the shows that are on are on are US sitcoms or dramas, too. That’s the kind of situation that got a group of Canadian economists and thinkers talking about the concept of a “ branch plant economy “ back in the 1960s, when economic nationalism first got going as a force. A wave of ill-fated nationalisation of energy assets followed under the late Canadian prime minister Pierre Trudeau. The policies of economic nationalism have largely been reversed since his conservative successor, Brian Mulroney, declared Canada to be open for business in 1985. Canada has even signed off on M&A deals that would have been unimaginable under Trudeau, such as the acquisition by Petronas, the Malaysian national energy company, of Progress Energy Resources, or the equally controversial takeover of Nexen by China’s CNOOC Ltd. In the meantime, Israel rebuffed an attempt by Potash Corp. of Saskatchewan to snap up a controlling stake in Israel Chemicals, with the Israeli finance minister warning that approving the deal would be “un-Zionist”. It’s even more ironic in light of the fact that Potash Corp. earlier had played the nationalism card to see off a takeover offer from an Australian-British mining conglomerate. But those decades left their mark on individual attitudes and awareness. Canadians remain wary of new US brand names — even those well established at home. Some Canadian friends of mine boycotted Starbucks, peeved at what they saw as a deliberate attempt to put local chains like Second Cup out of business in an increasingly bitter coffee war. Consider the failure of Target’s aggressive move into Canada, where it took over the leases of stores once occupied by Zellers, a name once as familiar to Canadians as Tim Hortons. My sister-in-law was one of those who was at first impressed by the bright, shiny aisles — and underwhelmed by the cheap quality of the merchandise, and ultimately nostalgic for Zellers. Just because it had a reputation for being the recherche, upscale discount retailer south of the border, didn’t mean that was going to convince her to shop there, she told me sternly. And she didn’t. And other Canadians didn’t. And Target shut down, leaving 17,600 very Canadian workers unemployed. And therein lies the rub. Like it or not, we live in a global economy. We buy smartphones made in South Korea or China and T-shirts made in Bangladesh. Yes, perhaps our cars are made in the United States — but probably not all the components and microchips are. 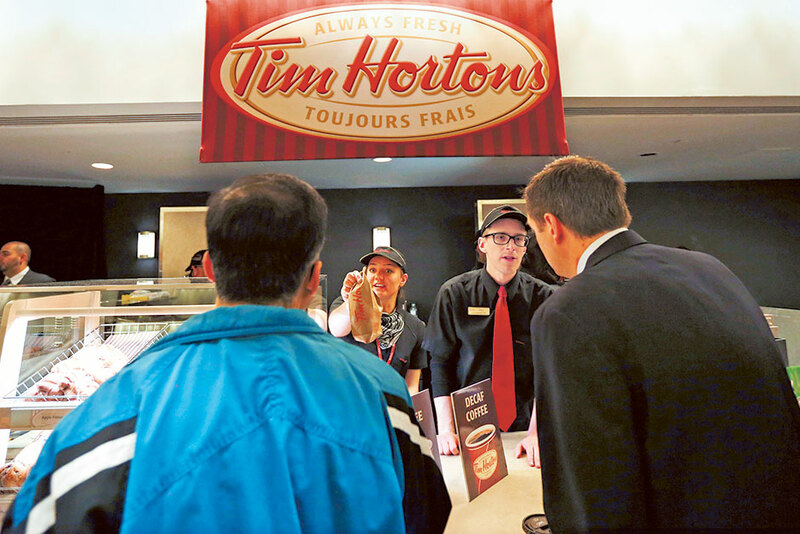 The irony is that this time around, Burger King/Tim Hortons — or Restaurant Brands International, as the new entity is now known — has managed to offend its customers on both sides of the border. And it has done so at a time when, even if governments are less prone to economic nationalism, individual consumers are increasingly focused on ensuring that our personal spending reflects our values and our identity. Canadians who have watched some great Canadian business ideas get acquired by US companies, who have shifted the base of operations and innovation south (think, Flickr, acquired by Yahoo), great Canadian entrepreneurs pursue their business ideas south of the border (think, Jeff Skoll) and watch as some other iconic brands collapse under their own weight (Research in Motion, anyone?) may be feeling particularly vulnerable right about now. That doesn’t mean that economic nationalism will be any more successful this time around. It does, however, suggest that whenever another cross-border deal is followed by job losses — and that transaction involves a company that deals directly with the public, as Burger King and Tim Hortons do — it might be a smart plan for the companies involved to devise something a little more deft than a mass layoff announcement a few weeks after the deal closes. That is, if they want to hang on to their customers.